IBPA is an association for every kind of independent publisher, from the big company with many employees to the tiny cottage with one (which likely defines Bright Ring Publishing, Inc.). Whatever size a publisher is, to be big or small is a choice. Early on, I deliberately chose to keep Bright Ring small—and to make it profitable. For some independent publishers, it’s the perfect combination. Bright Ring has been small and independent and, yes, profitable, from the get-go in 1985, and my plans say it will stay that way, economy permitting. Why is this choice one that makes sense? Why would someone choose to work alone doing what the big publishers do? When I asked several independent publishers of various sizes what they would like to know on this subject, all of them had the same questions about choosing the “small and profitable” route. Here’s the Q&A for all of you who are curious or considering your choice. A: Some publishers are people who like to work alone, who prefer to live their day in relative isolation without interruption. They like to have the freedom to vary schedules and work hours without answering to anyone. And they don’t want to be constrained by a corporate mentality; they prefer a more eclectic, independent approach to business. Q: For your one-person company, do you do everything that needs doing? Marketing? Sales? Page layouts? Cover design? A: The fact that a publisher is small does not mean that one person does everything. Freelance help is widely available, and a good national distributor will build the bottom line. Our national exclusive distributor takes care of trade sales, which keeps BRP in the black. I depend on my distributor to do a great job, and they do. I work with a freelance graphic artist to set up style sheets in InDesign, and I do the rest on my own, which is basically dumping in text and then moving text and photo boxes around so everything fits. We work together to produce covers. Photographs often come from generous contributors in my genre, including mommy bloggers and early childhood educators. And I take some of the photographs for BRP books. Because I offer workshops nationally and have a busy online presence, BRP has a following of customers who are devoted to purchasing books written by MaryAnn Kohl. Q: What is the secret to being profitable? A: Ahh, the secret. I’m afraid I don’t know “the” secret. But I do follow ten rules that have helped me maintain a steady profitable income over the past 29 years. I believe they provide good advice for any publisher who wants to remain small, independent, and profitable. Focus on one genre, one group of buyers and readers, and one format that will repeat in each new book so that readers will come to expect it. New information, same format. Your readers become loyal buyers. For example, all my books focus on art and creativity for children; all are presented in a landscape design, and all follow a recipe/cookbook style format. The topics change, but the format remains the same. Of course the books must have value to readers so that they will want to purchase them. Stay in touch with readers through social media, a newsletter, a blog, and/or some other form of communication. Involve your readers by asking them to contribute to the next book in some way. For example, for my newest book I’m asking contributors to share stories of children they have observed creating art at school, in daycare, or at home. The stories lend a personal “real life” touch to this book of art activities. Maintain an active website that offers free downloads and giveaways. And sell from your website. Use good accounting software such as QuickBooks, and hire a part-time bookkeeper who can handle payroll and taxes. Use a CPA for end of the year reporting to the IRS, one who will be a knowledgeable advisor throughout the rest of the year. Get yourself a good computer and up-to-date software if you don’t already have them. And give yourself a decent workspace, even if that means the dining room becomes an office. Be ethical. In today’s world, you will build customer loyalty because of this factor. Be professional. Being small doesn’t mean you can do without a great website, a well-made catalog or brochure, a terrific phone answering system, and beautiful business cards. Also, you should return calls and respond to emails in record time. Have a mission statement—a device for decision-making if you will—to keep your company focused and pointed towards success. My mission statement is “Bring good things to children.” If I feel that an invitation to do a blog interview or a TV guest spot or anything else is not in accord with this statement, then I turn it down. The mission statement also helps me decide not to publish all kinds of books that come my way on various topics, in various genres and with various writing styles. To be profitable, I must stay focused and provide what my readers want and expect. Q: Do you have a catalog that you mail to customers? A: Whatever I do, I try to do well while still being frugal. Having a folding brochure/catalog whose weight meets basic first class postage rates is one way to control costs. For my readers, it’s important to have a full-color mailer, one that folds to a size that the postal system handles without extra charge. Mine includes a mail-in order form as well as directions for online purchasing. 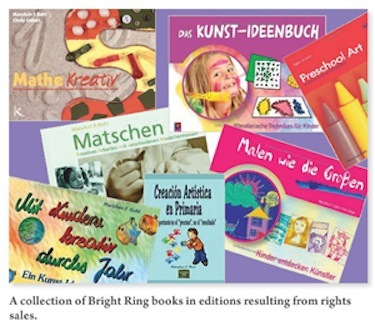 Bright Ring has a separate tri-fold full-color brochure that offers information on author workshops and presentations. The brochure was designed at an online discount site, Vistaprint.com, and it was produced on great paper for a super amazing price. It was easy to do and the results are excellent. Q: How do you decide which printer to use for your books? How do you get competitive prices? A: I send requests for estimates to at least three printers for every new book and every reprint. Because I have found one printer that always seems to have the best price, I tend to use that printer the most. It’s important to build relationships with your printer’s rep or account executive because they can often lower an estimate that you feel is too high. I keep a spreadsheet showing printers and costs that I can refer to easily. And I maintain good relations with my favorite printers by paying on time (and following rule number 8). Q: If you use an exclusive national distributor, are you allowed to sell books on your own? What is your best way of doing that? A: Bright Ring is required not to sell to our distributor’s customers in the trade, but is allowed to sell to customers outside that territory. My most profitable selling system uses the workshops and presentations I present around the country each year. As the author of Bright Ring books, I set up and organize full day trainings and workshops for parents, teachers, librarians, childcare professionals, and other educators. Often these take place during annual training days or at conferences where a group must provide a speaker who will draw an audience. These events sell many books and expand my customer base of happy new followers. And they pay well, which also supports the bottom line. Q: Has anything surprised you as far as profits go? A: International rights surprised me—big time. The income from selling rights to our books at the Frankfurt Book Fair was unexpected. Over the years, it has grown as overseas publishers purchase the rights to one book after another. Luckily, BRP’s books sell to both parents and educators, so the books are well accepted in the international market. If they sold only to teachers, the success would have been less astounding. I have used Gryphon House, Inc., as a rights agent in the past, and I am currently looking at new ways to sell more rights in more countries. Is anything more fun than seeing one of your books in a foreign language that you can’t even read? Great fun, and uplifting too! Q: What is your favorite sales tool? How do you reach your readers? 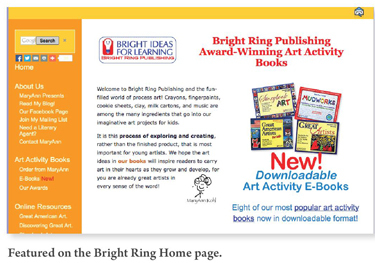 A: Bright Ring e-mails a free monthly newsletter called The ArtsyKidsNEWS to people who subscribe. The newsletter is also posted free through social media, which means it is shared with thousands of interested educators, parents, librarians, and childcare professionals. Each month, it features some or all of the following: free art ideas, a review of a new book by a non-Bright Ring author, inspiring essays and short stories about children and learning, and/or reviews of creative inspiring blogs—always with lots of photographs. The newsletter lists when and where I will be speaking, offers free downloads from the Bright Ring website, and always offers a giveaway—a free book to a randomly selected subscriber. Q: Do you do everything that publishers are supposed to do? It seems overwhelming for one person to operate the way a traditional publisher does. A: No. Bright Ring Publishing, Inc. does what works for Bright Ring. That’s one definition of what being independent means. Staying small and staying profitable allows a publisher to choose what works and skip the rest. MaryAnn F. Kohl is the president of Bright Ring Publishing, Inc., and will soon be celebrating 30 years of staying small and profitable. To learn more: www.brightring.com, www.facebook.com/maryannfkohl, www.facebook.com/groups/processart/ twitter.com/maryann_kohl.